The numerous descendants of John Thurtell (1762 - 1846) and Anne Browne Thurtell (1762 - 1834) have long considered Hobland Hall their "ancestral home," where family legend stated that their children were all born. It has been photographed and painted a number of times and has been visited by many descendants over the years. It was originally in Bradwell Parish, Suffolk County, England; but the location is now in Norfolk County due to changing county borders. The above picture of Hobland Hall hangs in the home of Susan Thurtell Miller, who has had it in her possession since the 1960s. It was painted by Louisa Thurtell Cook, one of the grandchildren of Benjamin and Anne Barber Thurtell. Benjamin was one of the children of John and Anne Browne Thurtell. 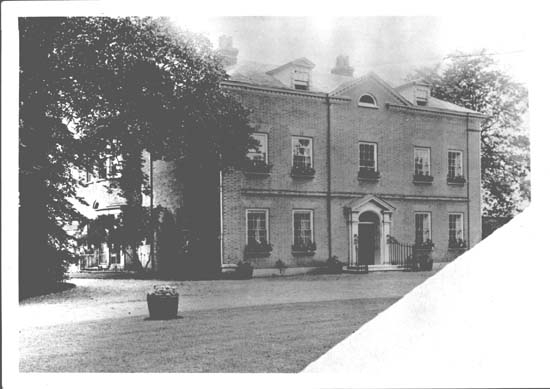 The photo of Hobland Hall on the left, copies of which are in the possession of many descendants in the United States and Canada, has been missing the lower right corner for well over 40 years. A large copy of the identical photo with the corner missing, hand-colored by Irene Thurtell Foresman Peters, is in the possession of Michael Foresman. Until fairly recently sharing a copy of a photo involved having a negative made from the print and then having one or more prints made from that negative, an expensive procedure. The print from which this copy was made using that procedure in 1965 was borrowed from Frances Thurtell McGregor. 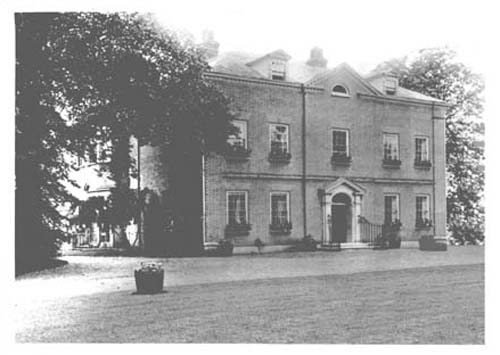 Her note with the photo showed, "Picture of Hobland Hall, Hopton, Suffolk, England, owned by John and Anne Thurtell, taken about 1902. Through the years one corner had been torn from the picture which accounts for the blank space. browne thurtell.html. An updated website was added in November 2000, and the page for John and Anne Thurtell is at http://www.geocities.com/thurtellfamily/gp/fam00002.html. Because of early Thurtell family websites like these, numerous very distant cousins worldwide have come to know each other; and various people searching for information about Hobland Hall have contacted Susan Miller. Information in My Ain Folk shows that the above picture was taken by Maggie Evans in 1898. This is the copy that was shared among the descendants of John and Anne Thurtell in South Africa. It appears to be identical to the photo shared in America but with the corner intact. The photographs above, on the left, and below are from the wonderful book, My Ain Folk, by Margaret E. Shearing, which she began in 1961 and which was completed and published in 2000 by her granddaughter, Margot Shearing (now Margot Collette) of South Africa. Information about Margaret (Murray) Shearing and this book, including how to obtain a copy, can be found at http://www.geocities.com/thurtellfamily/sa/margeshearing.html. A letter to Irene Thurtell Foresman Peters dated September 29, 1964 (a copy of which is in possession of Susan Persia Thurtell Miller) from James L. Buck, Birds Eye Food Ltd., Hobland Hall, Bradwell, Great Yarmouth, Norfolk, England, states that Hobland Hall is located in Suffolk, but the mailing address is Norfolk. The villages of Hobland, Lound, Flipton, Bradwell, Belton, Hopton, Ashley, Fritton, Belton, and Blundeston are all within 20 minutes horse ride of each other; and each have their own church (all Norman). The 12 children of John and their offspring have records and tombs in nearly all of these villages. There has been a church in Blundeston since the 7th century, and this is described by Charles Dickens in the opening pages of "David Copperfield." The lettering in the name Thurtell has changed from the early times as from Thurkeld, Thurked, Thurtle, and lots of offshoots of Thirtle. Inside the doorway of Hobland Hall is a brass plate that goes back at least to the 13th century. For over three centuries the estate was owned by Magdalen College, Oxford, and history records many famous tenants. On January 24, 1961, the Hall was almost destroyed by fire. Only the basement and exterior walls survived. 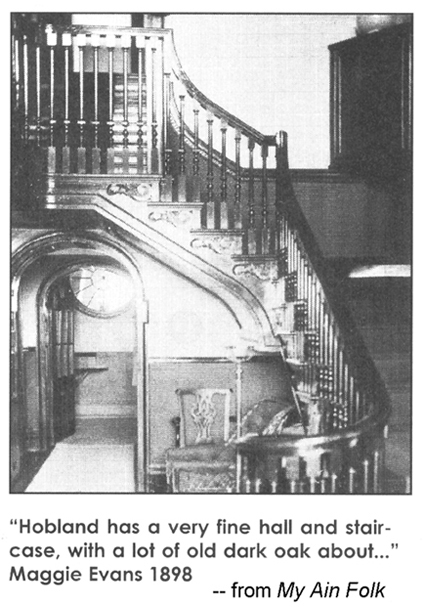 Mr. R. G. Carter reinstated the Hall to first floor level, retaining the Georgian architecture as far as possible. The Hall was reoccupied as business premises of Birds Eye Foods in the autumn of 1961. James Buck from Birds Eye Foods corresponded with Irene Thurtell Peters in the 1960's. Additional information was received from Frank Sayer, Social History Librarian, Norwich Public Libraries, from September 14, 1964, sent to James Buck, with a copy sent to Irene Thurtell Peters and a copy of her copy in the possession of Susan Persia Thurtell Miller. Hobland Hall (Hobbeland's or Hopland) is a manor held at the time of Henry III by Henry de Hopeland. In 1604 it was held by Sir John Fastalf, who gave it to Magdalen College, Oxford. Lessees included: 1724 Augustus Schultz, 1949 Gerard Trotter, 1768 David Urquhart, 1793 Thomas Fowler, and in 1823 John Thurkell. Subsequently Tom Barber held it and later Mrs. Barber and Colonel Lucas. 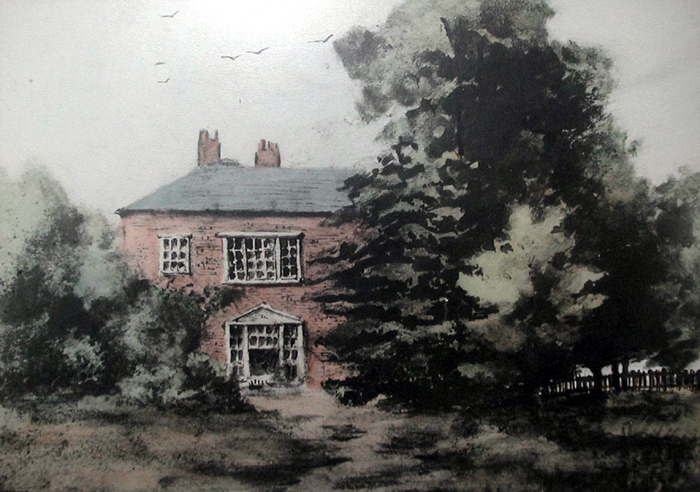 Ipswich Journal 11th and 26th July 1823 has adverts for sale of this manor at the Bear Inn, Yarmouth, 9th August 1823, by order of the assignees of the estate of John Thurtell, a bankrupt, of the Equity of Redemption of Estates situated at Bradwell, Hopton, Belton, etc. of the sites of the Manors of Hobland and Hopton, also a mansion house called Hobland Hall, several farms, etc., containing about 630 acres. In 1844 T. Barber occupied Hobland Hall. stone figures showing William VESEY of 1644 between two wives, who look like little dolls. Each has a child behind her, and below are curious carvings of four little girls and their brother." A letter from John Thurtell to Norton Nicholls dated April 2, 1804, advised that John Thurtell was moving to Hobland Farm on April 6, 1804. Reverend Norton Nicholls was rector of two parishes, Lound and Bradwell, in Suffolk County, England. 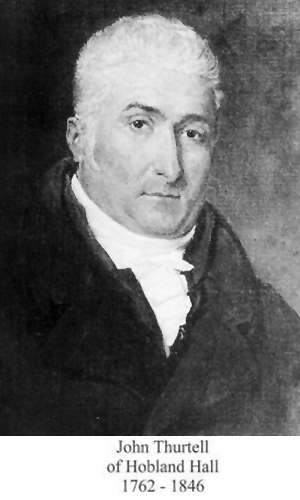 He lived at Blundeston, as there was no rectory in either of his parishes, from 1773 until his death in 1809. His correspondence and other papers, dating from 1750 to 1811, was preserved in the Beinecke Rare Book and Manuscript Library of Yale University, New Haven, Connecticut, and includes three letters from John Thurtell and three additional letters from his brother, Thomas Thurtell. Copies of these six letters are in the possession of Susan Thurtell Miller.
" a well built commodious mansion house, called Hobland Hall, situate in the parish of Bradwell, containing, on the ground floor, a large dining room and 2 good parlours, a kitchen, housekeeper’s room, store room, and servants’ hall, laundry, brew-house, and other convenient domestic offices; on the first floor, a handsome drawing room, and several bedchambers and dressing rooms, and on the floor over, 4 good bedrooms; under the ground floor are good arched cellars, and detached from the mansion are a double coachhouse, stabling for several horses, a harness house, and extensive pleasure and kitchen gardens, with hothouses, greenhouse, garden house, &c. A large and modern built farm house, barns, and other farming buildings. And about 362 acres of freehold, copyhold, and leasehold land. The mansion house (which is beautifully situate in a lawn of 32 acres, surrounded by 23 acres of plantations) is in a genteel neighbourhood, about 4 miles from Yarmouth, 6 from Lowestoft, and one mile from the sea, and with 68 acres of land, including the lawn and plantations, is in the occupation of John Penrice, esq. at the annual rent of 250l. The farm house and the residue of the land are in the occupation of the assignees." This was a very difficult time for the Thurtell family. On October 24, 1823, John Thurtell (1794 - 1824), the nephew of John and Anne Browne Thurtell, murdered William Weare. He was hanged for this crime on January 9, 1824, after a highly publicized trial. As described above, Hobland Hall was severely damaged by fire in 1961 and was a one-story building after that date. It again suffered severe damage from another fire, possibly in the 1990's. An email Susan Miller received on April 26, 2001, from Louise Johnson advised that Hobland Hall was about to be auctioned and that she and her husband were "considering bidding. 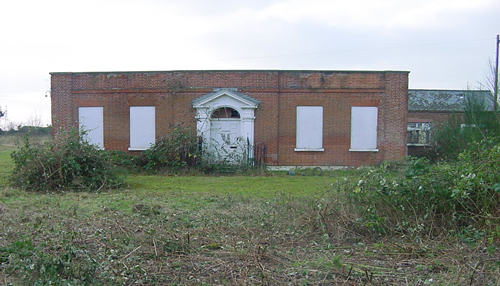 The site has planning permission to rebuild a Country Hall, and I was totally inspired when I saw your photo of how it looked in its glory days. I can assure you, from the picture I have of the current site, it is unrecognisable today. The estate is now reduced to about 40 acres - a far cry from the 630 acres mentioned in your history. From the details I have from the agents, the single story office accomodation (once used by Birds Eye) is now vacant and vandalised - it appears that there has been, once again, considerable fire damage." A January 14, 2002, email to Susan Miller from Tim Burgis advised that he had just purchased Hobland Hall and was looking for information and photos. He attacheded the photo on the left showing the current state of this formerly beautiful building. The 1898 photo plus additional photos and information from My Ain Folk were emailed to him the same day, along with a copy of the letter from John Thurtell dated April 2, 1804. 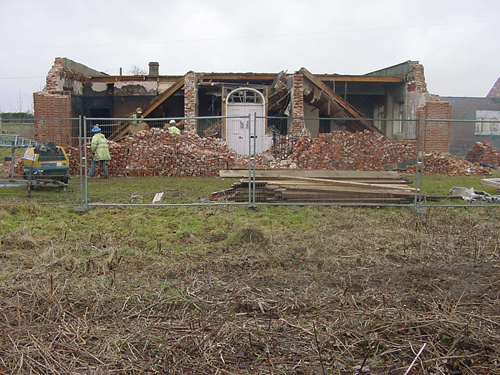 The photo on the right and an email from Tim Burgis on February 22, 2002, advised that "the hall was derelict and had to be demolished. It will be rebuilt [in] early 2003, hopefully." This email was forwarded to Susan Miller by another relative who had been hoping to visit Hobland Hall in early 2002. A January 5, 2003, email from Tim Burgis advised that "the cellar was unbelievable" and that " the new hall is half way up." The photo above taken by Bob Crook is displayed with his permission. On October 29, 2006, while "surfing" the internet, Susan Miller found the website Welcome to Geograph British Isles at http://www.geograph.org.uk. This included the photo on the left of Hobland Hall taken October 21, 2006, by Bob Crook. Its location on that website is described as near to Bunker's Hill, Suffolk, Great Britain. Sue Crook, the wife of the photographer, advised by email on October 31, 2006, that they had gone looking for Hobland Hall to photograph based on a request from David Veasey of Canada, whose ancestors had lived in the area long ago. They had been surprised when they saw that the building was new and that the patio area was not finished yet. She also explained that English county borders had been redrawn around 1974. "Bradwell and the surrounding areas, which includes Hobland, had, until then, been in Suffolk, but suddenly became Norfolk overnight!" Therefore "the old Hobland Hall was in Suffolk. 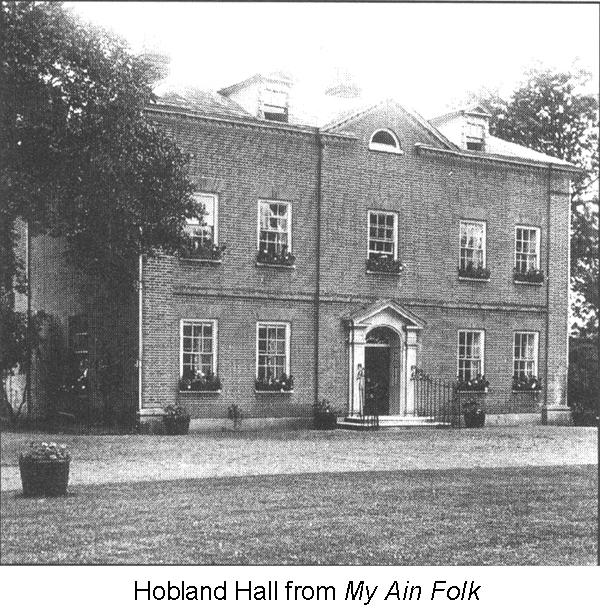 The new 'Hobland Hall,' though standing in exactly the same place, is in Norfolk." The above pictures of John and Anne Browne Thurtell are photographs of original portraits that were at one time in the possession of Roger and John Murray, grandsons of Dr. George Murray. The photographs are from the wonderful book, My Ain Folk, by Margaret E. Shearing, which she began in 1961 and which was completed and published in 2000 by her granddaughter, Margot Shearing (now Margot Collette) of South Africa. Information about Margaret (Murray) Shearing and this book, including how to obtain a copy, can be found at http://www.geocities.com/thurtellfamily/sa/margeshearing.html. English census records show that by 1841 Thomas Barber, born about 1801 in Yarmouth, Norfolk County, and his wife, Judith Barber, born about 1803 in Gisleham, Suffolk County, and their family were living at Hobland Hall, Bradwell Parish, Suffolk County, England. The 1871 and 1881 census records show Judith Barber, a widow, as head of the household. John Postle and his wife, Clara A. Postle, are living at Hobland Hall Farm in the 1891 census. Rosa Adelaide Parlby, a widow, is living at Hobland Hall in the 1901 census. It appears very likely that Thomas Barber purchased Hobland Hall at the bankruptcy sale but waited until the end of the lease of the tenant living there at the time of the sale before moving to Hobland Hall with his family. The Barber family moved from Southtown to Bradwell between 1827 and 1832 based on the places of birth of their children. 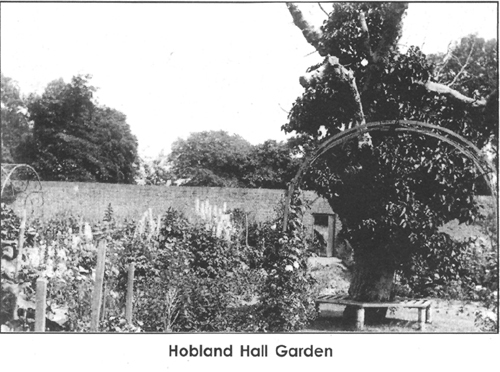 The family lived at Hobland Hall probably until Judith died in 1888. Thomas Barber had died in 1868. They had six daughters and one son, Thomas Q. Barber, who lived with his family near Hobland Hall at the White House; but he died in 1885, and almost all his sons seem to have vanished, probably emigrated. 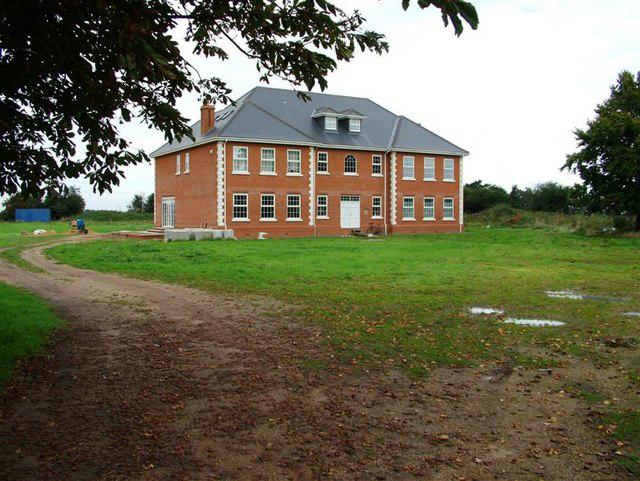 His wife was Emma Maria Coleman; and after her husband's death she went to live with her brother at Brundell House, Suffolk, with her unmarried daughters, so the Barber family had all left Bradwell by 1891, having been there for more than 60 years. Based on patron submissions to the IGI online at http://www.familysearch.org as of December 2006, Judith Barber was a sister of Anne Barber Thurtell, the first wife of Benjamin Thurtell. This record shows that Anne, Judith, and James Barber were all born in Gisleham, Suffolk County, England, the children of James Barber and Elizabeth Welton. This information needs to be verified but appears very likely. Anne Barber Thurtell died September 01, 1834; and the Register of Burials in the Parish of Hopton, Suffolk County, England, for 1834, page 11, lists Anne, wife of Mr. Benjamin Thurtell (abode: Yarmouth), and shows she was buried on September 6, 1834, in the Parish of Hopton by Lowestoft, with the ceremony performed by Barth. Ritson, Perpetual Curate, and that Anne was age 38. 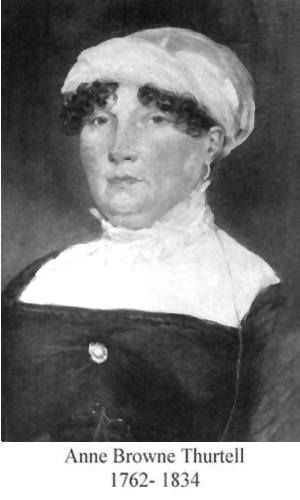 Anne Browne Thurtell, her mother-in-law, died September 12, 1834. John and Anne Browne Thurtell were buried very prominently inside the church at Blundeston, Suffolk, England, in the floor to the left of the old font. In 1993 they were moved during renovations and have been imbedded in the wall inside the church. The assistance of the numerous Thurtell family and Hobland Hall researchers and photographers is greatly appreciated! I am always interested in exchanging information regarding the Thurtell and related families!